Iris at Sting My Heart has gotten me to thinking about the people/relationships that I am thankful for. God proclaims that I am his chosen. And that he gave be the chance to be one of his chosen. I am thankful that God showed me his son and that Jesus gave me the opportunity to become a child of God. I am thankful for my Cowboy . . . Here is a recent photo of him. I am thankful that he is getting some rest. He has been through a rough year. He had a knee replacement in January and is now awaiting to have that same knee removed due to an infection. It is a blessing that he managed to have a cat nap. I am thankful for over 30 years he has spent being a Godly husband. I am thankful for our relationship. I am thankful for my house . . . This is what it looked like before we moved in. I am thankful God gave us a beautiful home so that we can share it with friends and family and build stronger relationships. I am thankful for my Sunday School class. They are a group of amazing people. Anytime we or anyone else has a need they serve God by helping anyway they can. They are a real blessing to us. I am thankful that I am free and able to baby sit my new grandson and that we have a relationship already. I am thankful that he smiles when he sees me. I am thankful for my kids. They are amazing. Our son lives in Missouri and we don't see him often. Yesterday we received a really sweet email from him. I am thankful that even though the miles separate us we are still a family. I am thankful for new friends that we have met through ministry. I am thankful that we are building working relationships and that we are Serving God together. I am thankful for my new friends. The friends that I have met through this wonderful venue of blogging. You all know who you are. Thanks for your prayers,support and encouragement. I am thankful for Kelli over at theresnoplacelikehome she hosts the amazing Friday Show and Tell. She has become a friend that provides me with much inspiration. I am thankful for Amy Dean our Word Filled Wednesday hostess; another friend that gives me inspiration and encouragement. I am thankful I have sisters. And lastly I am thankful for Iris for giving me the inspiration to think about the wonderful people that are a part of my life. Thank you for reminding me how special these relationships are. One of my favorite things to do is to end the evening or just before dinner have a long soak in the tub. When my kids were still at home and Cowboy worked in the corporate world I would try to have a long quiet time to myself just before he arrived home. Now it is something I do just before bedtime. I dim the lights. Light a special candle. Fill the tub with hot steamy water and allow Calgon or something similar to "take me away". Today Rachelann at Home Sanctuary suggested that do something to serve someone or be a Blessing to someone. I have been thinking today about how I can be a blessing to someone that is special to me. Do you know someone that needs a hug? Do you know someone that is going through a rough time and just needs to feel God's precense? To be reminded that God is faithful? There is someone that is close to me that needs a hug. So I am putting together a spa basket for her. It will include a jar of my favorite bath salts,a pretty embroidered hand towel, a candle and a crocheted doily for the candle to sit on. And a special book 15 minutes with God by Emalie Barnes. I hope that this small gift is a Blessing to my special person. Tommorrow (only a few minutes away now) is Thankful Thursday. Iris has suggested writing about relationships. Come by and visit me and Iris at Sting My Heart. If you decide to Bless someone by making a spa basket let me know. Thank you Amy for this beautiful reminder of God's love for us and allowing me to use your work. I am Blessed by Amy's sweet spirit in sharing her work with me. On Wednesday I pick up food from our local food bank to distribute to our teenage clients. It is through the distribution of food that we show these kids that someone cares and that God loves them. Came by earlier and so I went over to see her and thank her for dropping in. Well she has the most amazing site filled with yummy things. I am getting hungry just thinking about it. Well she must be really cool because she is writing a cookbook and to celebrate she is giving away a book. I am not going to spill the beans but it is a mystery novel and sounds like a neat read. I hope I win but to win I have to pass it on. So if you go over and sign up you might win. Run by and check it out. And let me know if you win. Thanks for stopping by. Don't forget to read my earlier post below. 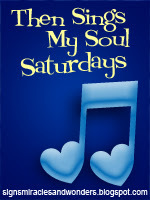 I didn't get to follow up on my Then Sings My Soul Saturday post yesterday like I intended. I'll try to do it tonight so please come back by. And I actually thought this week wouldn't be as busy as last. I love my new yard I pray that it can survive the heatwave. early enough but it is my day off after all. I don't show my appreciation. facility tomorrow. Hope they are good. and out of there so I can sew. all my ways acknowledge him and allow him to direct my path. I am reading... blogs and that is all. major things on my to do list. feet. I haven't even turned on any music yet today. my dog. She is really late getting a summer haircut. One of my favorite things...my dog. sewing in on Friday, and making some changes to my blog. The Welcome mat is out. Please come by and visit. And leave a comment. I try to answer each one. I love visitors. And Daisy loves visitors too. She thinks everyone comes by just to see her! Good Morning. Welcome to our blog! My name is Daisy and my mom invites me to write on Saturday mornings while she listens to special music. I love my mommy. She is my very favorite person but I also love my dad and my horses. Opps sorry. Mommy says the horses are not mine they belong to the family. Boy sharing is so hard. Mommy is teaching me about sharing so on Saturdays I share my friends because friends are special. And today I have a really special friend to tell you about. She is just really sweet and I bet she is really fun to play with. Her mommy posts pictures on her blog. Here is a photo of my new friend. This photo is a few weeks old. Isn't she just really sweet. And you will never guess what her name is! Her name is Daisy! I am just so honored. Well I know they didn't actually name her after me but it is just cool we have the same name. On Thursday her mom Kelli wrote a really cool post and so I wanted to share one more picture and then send you over to their blog. Here is another photo of my new friend Daisy. 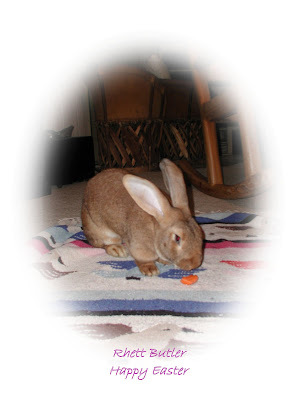 Please go by and visit our friends Kelli and Daisy and read the Thursday post. Their blog is called Kellishouse.blogspot.com. You can go to our sidebar and click on the link. And don't forget to go by and visit them on Friday for Show and Tell. Well duty calls I need to go outside and help my mommy feed the horses. Did I tell you I love my horses? Today this song is speaking to me. I don't have the words right now to share. Please visit me tomorrow for a 2nd installment and my thoughts about this song. 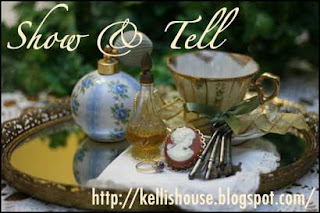 Welcome to Show and Tell hosted by the amazing Kelli over at Theres no place like home. Her link is on my sidebar. This week I started keeping my new grand baby. He will be 9 weeks old on Saturday. I am so Blessed and thankful to be able to keep him. I have had an amazing week. My daughter his mommy has never been a great reader. She didn't begin to read until middle of second grade. And she was never a great speller. The public school she was in for K to middle of 2nd grade did not teach phonics. She really didn't understand and become a great speller until her jr. year when she was in speech class. Her brother on the other hand was reading when he was 4 years old. I was amazed when I realized as I was reading to him that he was picking out words. My daughter attributes this to the fact that her brother had ABC sheets. The were Sesame street and they had pictures and the letters in upper case and lower case. So he was able to learn them while he was supposed to be taking a nap. So when my daughter found out she was pregnant she said she wanted to find ABC sheets for the baby. Well I haven't found ABC sheets yet but I did find these. I found this really cool picture in a craft mall. 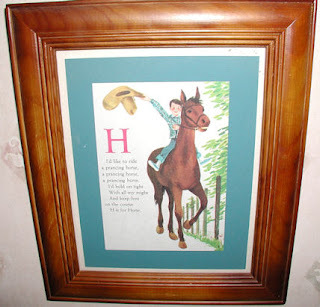 I think it is actually a page from a children's book that someone matted and framed. I found this one too and of course couldn't pass it up. We are all about horses around here. My daughter has plans to take a photo of the baby on her horse as soon as he can sit up. So stayed tuned because I'll be posting baby and horse photo's soon. Thank you for visiting my Show and Tell today. I hope you enjoyed the prints and my story. 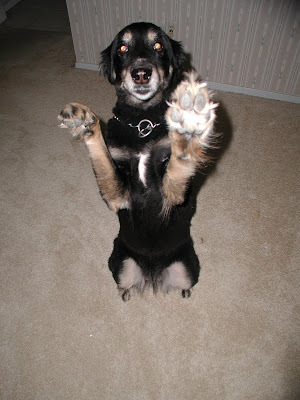 Don't forget to stop in tomorrow for Daiy's Doggie Bloggie post. She will be posting about a very special new friend. Please visit Iris today at eph2810.com for Thankfull Thursday. I'll be adding my post in a little while. I'm back to add my list. Today I am thankful mostly that I can be a help to my daughter and son in love by babysitting my new grandson. I am thankful that God has a plan for our loves and works out the details. I see him faithfully doing that. A year ago I would not have been able to have this opportunity. I am thankful that our boys program began this week at the TYC facility and all has gone well the first three days. I am thankful that again God is faithtul to work the details. I am thankful that we can share His love with these kids. After 3 weeks in our new house finally the dryer is fixed and so Saturday I get to wash clothes. That makes me happy. I am thankful for my house. I still just love it. I am having the best time settling in and making it mine. I am thankful that I live in the country on over 160 acreas but I am 3 minutes from Walmart. Don't get me wrong I hate Walmart. But I am 8 minutes Kroger and Tom Thumb and any other store I wish to shop at. Or just window shop. That is usually all I do. And last but not least I am thankful for my Sunday School class. When we tell them about a need for the ministry whether it is socks or makeup for the girls or canned food when the pantry is bear they step in and fill the need. They are a sweet group of amazing people. In May when my cowboy was invited to go to an Automotive industry meeting and speak about the ministry our class took up a collection to buy him a new suit. Our God provides. I am thankfull. Thanks to Amy Dean at http://www.the160acreawood.com for providing Word Filled Wednesday. I am filled each Wednesday morning with thankfulness that I am able to serve God by providing for those in great need. As I am off to the food bank this morning. I am grateful that Amy provides this post. Here are Amy's thoughts. Isn’t that the truth? Kind of hurts when you think about it, some children have a natural sweet nature and others have to work so very hard at being good. My lovely little darling in this picture is known for her smile, but boy that temper.. when it flares up, you better watch out!!! 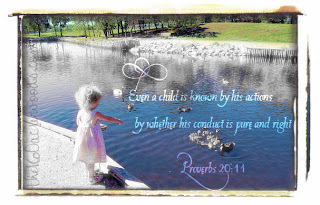 Something we.. my precious munchkin and I need to take to Jesus… With the grace of God we all need to “known by our actions”. What are your actions saying about you today? It is such an honor to post the truth here with all you wonderful ladies. I can’t tell you how much I look forward to my week and checking your blogs! I’m always touched by God through WFW, and I hope you are too! It really is a love offering to God, and I hope you feel that way too! I’m working on a surprise next week, so make sure you come back!!! This is not the week that I needed to deal with this. But the pretty template just didn't seem to work. So I have changed it back. I sure don't want to loose any readers! I know when I go to a blog and it loads slowly I get bored and leave. I am in a world presently where I don't have a lot of time. And I am realizing what other peoples worlds are like. My baby is 26 years old. She asked me today if she was like her baby. He requires lots of rocking and nurturing. My answer was (I didn't really remember for sure)"I don't think so because I happened to have another 2 year old at the time. So I know I didn't have time to do a lot of rocking." And then by the time she was 6 months old. I was keeping other children. So it was a little hectic around my house. I can sympathize with all you guys out there that have multiples or more than one pre-schooler. And, my advice is pray. Pray everyday and trust in the Lord. He will give you strength and sustain you. And remember he won't give you more than you can handle. He is the one that gave you these Blessings and he will provide. Duty calls now so I must end this post. Thanks for coming by and visiting. I really hope that I can make a prettier look over the weekend so come on back by and check it out. You'll never know what my blog looks like. Our ministry to teenage girls is called Mission Makeover because as a believer we are constantly being "madeover". I hope that the makeover of my blog and the words from my heart Bless you and bring you closer to being "madeover. Today I am tackling the huge job of just getting through the day with a million things I have to do at home and not being there. I am spending my day with the baby again today. Yesterday we learned our ABC and that V is for Villarreal! I'll be writing more later but for now I am off to babysit. I was not sure if I would make it back to finish my post. Here's my Tackle it Tuesday project for today. Organizing my life and schedule. This week I have to keep the baby Mon,Tues,and Thurs. My husband is working this week all week at a TYC boys facility only a few minutes from our house. But the deli ma is we are down to one vehicle. Great timing! So I am tackling schedules and trying to get everything organized and running smoothly. Well Good evening. I didn't get to write my daybook entry this morning because today was the first day my daughter went back to work. It was a long for all. She expected to only be gone half the day but ended up being in the office all day and arriving home after 5 and had to nurse the baby. So here I am after 6 writing. I have the cutest grandbaby but I bet you already knew that. Here's my daybook entry. Please go over and visit the others too. Outside My Window . . . 6 a.m. edition what I saw this morning before I left. The young horse that lives next door was still asleep. I always smile when I see such peacefulness. It brought back memories of us catching all of our herd asleep early on Christmas morning. I'll have to share that photo when I find it. I am thinking. . . my life is not the same. For many reasons as you can imagine. Just my daily schedule is altered and changing. It'll be a few days minimum before we get in a routine. I am thankful . . . I have so many things I am thankful for. I guess the biggest thing is that I am available to help by keeping the baby. But to tell you the truth I don't think I had any other option. It is amazing when you see things happening that you know God designed. What is going on now is orchestrated by Him. From the kitchen . . . tonight I am cooking a roast and potato's. I need ideas from you guys on meal planning. My lifestyle is changing so much. Wow. I am wearing. . . kahki capri's which I cut off myself they are Gloria Vanderbelt stretch pants that I love. I cut the off and let the bottom fray and they are really cute. I have learned I have dress differently and watch my jewelry. I am wearing a cute little pink striped Steve and Barry's t-shirt. Deep v-neck with a white tank underneath. No earrings, no necklaces. The baby spent his day holding onto the neck of my shirt. Smiles. Oh I have on sandles too. I am creating . . . a lovely environment for our family. I am doing the Home Sanctuary daily activities and I love it. See my company girls button. I am going. . . to have a really busy week cooking at a boys TYC facility on Wed. for our ministry, baby sitting Tues and Thurs. Friday putting my feet up and resting or playing on the computer. I am reading. . .instructions on how to change my blog layout, my cookbooks and my Bible and hopefully I'll be reading books to the baby soon. Including my Bible. One of my favorite things is seeing answered prayer. Here is a picture that I am sharing. It is a few weeks old but here is the sweetest baby at least in my world. Thanks for coming and visiting. And please leave me a comment. I am really interested in how the layout is working. Does it take forever to load? Have a Blessed Week. Check back later I will be writing a post about how I made my home a Sanctuary this weekend. I started keeping the grandbaby this morning so haven't gotten to write my daybook entry yet. One thing on my list is to change my layout. Have ya'll trouble? Yesterday I was working on it and checking and then again this morning. It doesn't load properly and I can't read the comments. This started with the layout. Altough it is pretty I think for some reason it just isn't going to work. Please don't give up on me come and visit I'll fix it soon. I'll be adding my daybook in a little while. Have to feed the baby. Back to the peaceful sleeping Cowboy. I write today to ask all my friends to please pray for my dear Cowboy. I haven't written much about it but I know that God uses people to hold us up and to intercede. And we need intercession. Last May . . . as in May 2007 Cowboy tore the cartlidge in his knee. On this particular knee he has had 7 surgeries. He has needed a replacement for almost 10 years but the doctor said he wouldn't do it till Cowboy was at least 50. Because we are now full time in ministry we no longer have health insurance and so he had to go to the county hospital. After many visits and pain meds they finally did replacement surgery in Jan. of this year. Yes that was 8 months after the current injury. Almost immediately after the surgery we knew that something was not right and we were suspious that it was infected. He has had a miserable time since January. Sleeping very little and having to function on pain meds and, they don't even really help a lot. On June 16 he had a visit with the doctor. The doctor ordered one last bone scan and said he wanted to do surgery asap. By asap he meant in a few days as soon as the scan could be done. We still haven't had the scan and now they have scheduled another doctors visit for August 7th. Our wonderful Sunday School class has been keeping track of what is going on and one of our friends from class called today to let us know he spoke with the church staff to see if they knew of a doctor in the church basically just seeing if someone could help out. Amazingly there is a church member that is on the hospital board. Does God do funny things or what? Well he was contacted on our behalf just before going he was leaving to to go on a mission trip with our church. He told us who to speak to and how to "push" to try to get things speeded up. He also said he would check into it when he returns. Just hearing this was such an encouragement to us. Please pray with me for my husband. He is in such pain. And it is so hard when your active to have to become inactive. All this effects the ministry and his ability to work with kids too. Sometime you wonder what is going on. And sometimes all you can do is prayer and just trust and lean not on your own understanding. So while we wait. We trust. We lean and sometimes we sleep. Welcome to our Saturday post. Daisy wanted to introduce you to a new friend. 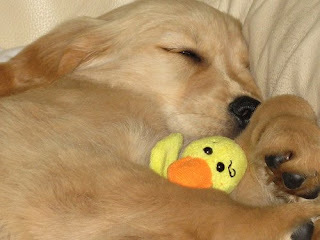 Here is a photo of Daisy and her friend. Isn't he just adorable. He sits up pretty too. This is Duhgall his mommy has a blog over at http://sweetcottagedreams.blogspot.com/. She writes about him a lot. He is a really smart dog. He gets to go for car rides. Here is his picture at this really cool store that he went to with his mom. It does look like a really cool place. I get to go for car rides too but I have never been in a store like this. Maybe someday I can go for a car ride with Duhgall and his friends. Thanks for coming by and seeing me today. I have to run outside now and check on the horses. That is my daily job. While I do that my mom is going to share one of her favorite songs with you. Thanks again for visiting me and please go by and say "hi" to my new friend Duhgall. Kutless' song Strong Tower is an amazing illustration of God's promise and provision for us. 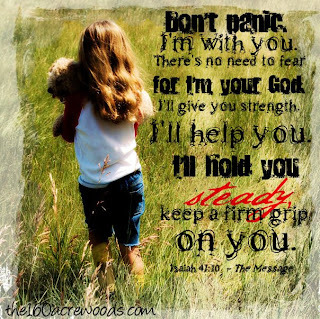 We can run to him when we are lost and lonely and he will provide shelter and salvation. Thanks for stopping in and we hope you were Blessed by your visit. Welcome to Show and Tell hosted by Kelli today I am showing a small part of my cookbook collection. This photo was actually taken in the last house but they are in the exact same place here in the new house. This cute little old shelf sits on top of my fridge. Beside it in the photo is a tin flower container with rabitts on the outside. It is actually a part of a collection of wallpaper from around 1989 or so. I love rabitts. The flower container is on our kitchen table now with the same sunflowers and it just looks lovely. 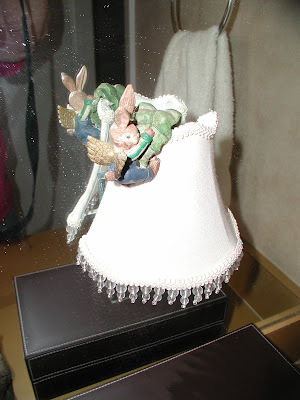 Below is a tin sculpter of yes rabitts again. It is now sitting in my kitchen window and it fits perfectly. How I wish I had a camera to show you guys how they look here. 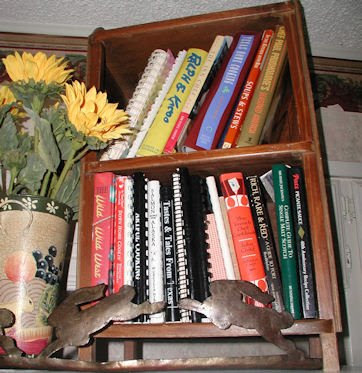 Here area a couple of my favorite cookbooks. I love this cookbook. I bought it in the 90's. It is actually one of my favorites. Most of the dishes require a lot of work but they are absolutely fabulous. 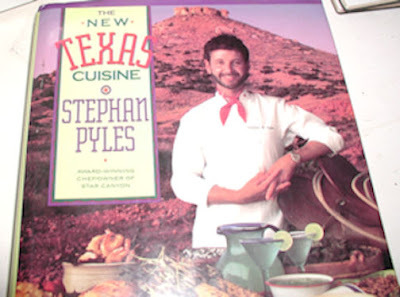 We were lucky enough to eat at Star Canyon in Dallas while Stephan Pyles was the chef there. It was amazing. Each recipe that I have tried in it I have written the date and a little something about how the recipe turned out. A totally different type of cookbook. Most all the dishes are simple. I love this cookbook and it has kind of an interesting story. 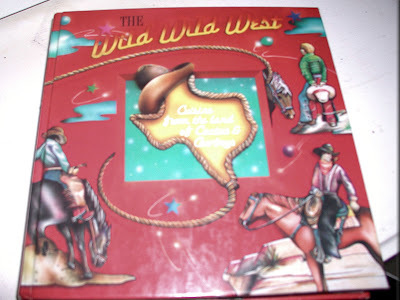 I bought it in Fort Worth at Will Rogers Coliseum at a Cutting. Some of you might be wondering what is a cutting. Well that is lingo for an event where horse people take their trained horses and compete. The horses work cattle. It is a really cool and interesting event. 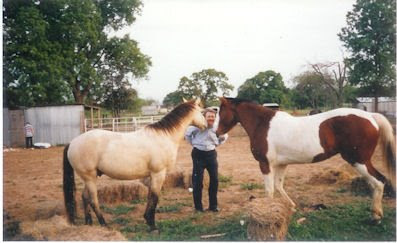 Our buckskin horse (he is the one that is a light tannish almost white horse) is a cutting horse. What cutters do is work cattle to put it simple. But a cutting horse show is the best of the best showing thier skill. This cookbook I bought at the cutting (they have vendors sell goods). This book was published by the Odessa Jr. League. It is a really well put together book. A few years later I met a lady who became a dear friend that was part of the group that put together the book. I learned that every recipe in the cookbook was tested and proved to be perfect and worthy. I have not tried any recipe that I did not like. Of course there are some that didn't sound good at all to me so I didn't try them. But overall I love this cookbook. It is one of my favorites. But my all time favorite (I am sorry I don't have a photo) is Betty Crocker. I'll have to definately take a photo of my version. I have a story about it too. I'll have to share it soon. I hope you have enjoyed seeing my favorite cookbooks. Please leave me a comment and let me know too how you like my new look. Have a Blessed Friday and come back and see me tomorrow for Daisy's Day. This morning when I wrote and passed the Joy on to Kelli I was thinking about the things that I am Thankful for. And in the back of my mind I thought I had read about Thankful Thursday. Well I had and I found it. Above is the button for Iris' Thankful Thursday. I went over and checked her out again and I found that she was sharing a wonderful verse today. This verse means a lot to me and so I decided I definitely wanted to share it and share what I am thankful for. Proverbs 3:5&6 Trust in the Lord with all your heart and lean not on your own understanding. But in all your ways acknowledge him and he will direct your path. I searched my archives because I had thought that I had used this verse one week as my verse for the week. To my surprise I had not. But I will use it next week and each day I'll share a different story about why this verse is so meaningful to me. So you have to check back to find out. I am totally thankful that God provides. I am amazed over and over at how he answers our prayers. Sometimes not in our timing and maybe not in the way that we wanted or asked but there is always an answer. Some people says God answers three ways Yes, No or Not now or later. I believe this to be true; many times I have seen him in action especially with the Not now/later answer. And, many times when I have been disappointed thinking he answered no to something that I thought I really wanted/needed he was really saying not now. Many times that I have sensed him saying no it turned into a yes because it was/is his timing not ours. I am thankful that God is patient with me. This is I big one. Because, just imagine how patient he is. When we just keep doing the same dumb things he just keeps on just doing the same thing. Loving us. No matter what. He speaks to us through his word or through encouragemnt from someone he shows us that he loves us. And that he is patiently waiting for us to just trust. To trust and turn everything over to him. I am thankful that God gave us Jesus and that by trusting him and beliving him that we can be his children, that we are all daughters of the King. That makes us all princesses. That is cool. I am thankful for Jesus' sacrifice for us. And I am thankful for all the wonderful people that I have met through this whole thing called blogging. Some I have already mentioned this week. Some I have not,but to all those of you out there that I have read and commented on your blogs please know that God uses you everyday to bring Joy to someone. Thank you Iris for letting us all share the Joy on Thursdays. Here is a little bit of joy for you. Early Show and Tell? No today I pass the gift of Joy to a wonderful friend that brings Joy to me everyday. If you have not met Kelli you have missed just pure delight. She has an amazing blog. And is wonderful inspiration to me and many others. Her posts are sweet and she has wonderful decorating ideas. Go by and see her and please go and see her tomorrow too. Thank you Kelli for all the kind words and wonderful inspiration you share to help each of us make our houses home. You bring me Joy. For Kelli . . . I mentioned on my Sunday and Monday post about my quest this week to share Joy each day I am delivering this gift to some special friends. But it is a gift for everyone. Please if you want to let someone know they bring you Joy please grab the photo's and pass them on. They remind me of another free gift a special one that is actually what allows us all to have Joy. It is the gift of Jesus. I hope that each of you reading have accepted Christ as your personal savior. He can give you Joy in more ways than you might know. His gift is free. My prayer today is that someone will accept this the biggest gift ever. Thanks Amy for this lovely illustrations of God's Love. Before I tackle my Tuesday project (see the button on the sidebar) I have a gift for a special person. On Sunday I wrote about how God uses people in our lives to show us his love. It is my prayer that I do that everyday in our ministry. But on a personal note I want to share Joy this week with some people that have been a Blessing to me. And today since I learned about Tackling Tuesday from Amy. The cool thing is she has her own website now. Please go and visit her. I originally found Amy through her Word Filled Wednesday which is amazing. She has graciously allowed me to use her work by allowing us to print her scripture illustrations and pass them on to our clients. This is one way we show them that God loves them. And hopefully we pass Joy on to them. Thank you Amy for all the Joy you have given me. Here's my gift to you. I still don't have photo's but I know this project most of you can imagine. I am finally tackling the sewing room. I know some of you guys do that periodically and just clean and organize and touch, and ohh and ahh over your fabric and press and refold. And I do that too on ocassion. Actually I do the ohhing and ahhing frequently. I love fabric. But anyway my project is to get it all out of boxes and onto shelves so I can enjoy looking at it and hopefully someday soon sew some of it up into marvelous treasures to enjoy and share. So I am off to tackle the mountain of boxes in the sewing room and hopefully by the end of the day I'll have it finished and ready to enjoy. My sewing room gives me Joy. Please pass on the Joy today. Amy I hope you have a Blessed Day. p.s. Come back tomorrow and see who I'll be passing the Joy to. I found this wonderful little item last week. I think it was at Kelli's but I am not sure. I visit so many wonderful places and each of these little meme thingy's lead me to another wonderful new friend. 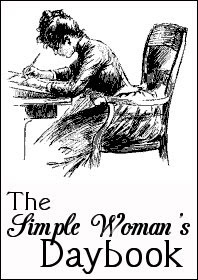 I am participating on Mondays with The Simple Woman and doing her day book. Outside my window . . . horses grazing on the newly growing green grass that I water in a desperate desire to keep growing. It is really hot here. Mondays are quiet outback and next door. We live in an amazing place. I am thinking . . . how much I enjoy all the meme's that I participate in and all the new friends. They bring Joy to my day. I am thankful for . . . my husband, even though sometimes I don't show it and I don't feel that way. And I am thankful for my kids and how God provides everything we need. I am creating . . . Home. Still organizing and unpacking and hanging pictures and moving furniture around, and around and around. Think I am done with the living room though just need a few more accents. I am going . . .To relax, enjoy and be joyful this week. And finish up projects. (Next week I begin babysitting my new grandson.) I probably will go and rock the baby or put out fires over there at some point! I am reading . . . my Bible, still working on Psalms everyday. I would love to read a good novel but I wouldn't get anything else done. I am hoping for . . . rain and some extra money for flowers for fall and that you all find Joy today and all week and that God shows you his love. I am hearing . . . nothing but the ac at the moment but will be putting on the cable Christian music c.d. I just love listening to it all day. Around the house. . . less boxes. Yea. (well actually they are all empty and on the deck) peacefulness. Last night I lit a candle and hung roses from last week in the kitchen window. The look lovely drying. One of my favorite things . . . I am still enjoying sitting outside at night but I guess I would have to say my house. A Few Plans For The Rest Of The Week . . No real plans just the normal, laundry (which I already started) moving the water hose, finishing up organizing and getting into the sewing room and finishing the makeover on my blog, and giving a gift of Joy to some special friends. Waiting for my daughter to call for help or to just hang out! Here is a picture that I thought I would share with you . . . I am wishing you all Joy this week. Please read my Sunday post. Sometimes God puts people in your lives to show you that he cares. That he is there. That has happened to me recently. Sometimes you know that you have God's love. You have faith that he is there. And you know that all things work together for his purpose. And you know that you are doing your best to follow him and to do what he wants. But, sometimes you need to feel the hand of God through someone tangible. A friend that touches you and maybe even puts an an arm around you and just holds you while you cry. Ihave some friends like that. Some of them I met through this wonderful blogging world. Some I met through my (cross that out)...the ministry that God has allowed me to be a part of. ministry. This week I want to show them how much I appreciate them. I am not real blogger or computer savy. And I don't know how to make a fancy button but I have figured out how to upload photos, doctor them with Corel and how to send them in an email or post on my blog. The above photos I am sending to some none blogging friends today. This week I am going to give them to my new bloggy friends. If your a new friend and you haven't left a comment and you want to share my Joy with your friends then please take the photo and share with someone that has been Jesus to you. Please leave me a comment because it is the comments too that make us all feel Jesus' love during those times that things are tough. Later in the week I think I will write about how hard things are right now. But for now I find/seek joy. Yes we would be lost without his love. Thank you God for the things of nature and your word that shows us your love. My soul reaches out to you to feel your presence so that I am not without you. Welcome to Show and Tell Friday hosted by Kelli click on the button and go and visit her and all the other wonderful Show and Tells. Today I am showing two things. I was inspired today by some other Show and Tell post to show a tiny treasure. Here is one of my tiny treasures. It is a little angel bunny that is meant to sit on a flower pot but I just think it is adorable on the pretty little night light. Which BTW I love too. This photo was taken in the old house. The light is still in the hall bathroom but the bunny is in the master this time. I'll show a photo soon I hope. There is quite a bit of history following this desk. It is actually two pieces. 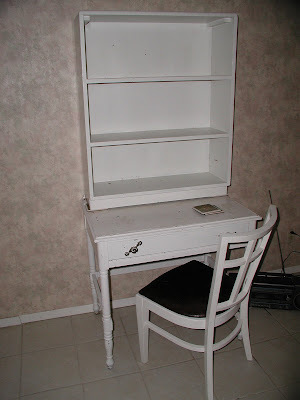 A desk with a bookcase on top. The bookcase was originally in the house I grew up in. It sat in the living room behind the front door and originally was stained pine I think. It held my mother and dads treasured set of encyclopedias. Which BTW I used all growing up. My mother almost had heart failure when I threw them away. BTW she doesn't throw anything away. The desk I acquired elsewhere and I'll share more about that later. This is the second Show and Tell installment of this desk. Check back next week to read the saga of the desk. I'll give you a hint. It isn't in the kitchen and it is getting a makeover. I hope you have enjoyed a little peek into part of my tiny treasures and I hope that I have peeked your curiosity to come back and see the treasures that are here. This is my new house! I just love it. I called it a cottage because it just looks like one. It is behind a white wood fence in the country. Come back and visit and hopefully soon I'll host a tour. your faithfulness stretches to the skys. 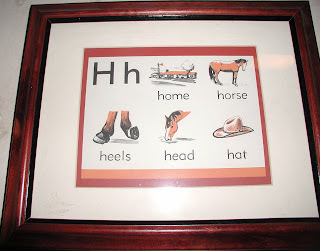 Please visit Amy over at her new address the160acreawoods.com for more wonderful Word Filled Wednesday posts. She has a new address so click on the new button on my sidebar. What is it they say about this best laid plans? Well I had a list of things I wanted to do today and guess what. I know you can already tell I didn't get to work on the blog. I did search for templates but couldn't find anything that I liked that was free and that I could figure out how to use. I have this category called Blogging for dummies. This post will go there. I actually have learned alot and I am proud of myself but I am slow sometimes.
. . . how do you post your text in color and different fonts? I know it is a simple thing but I just never have the time to play around and figure it out. Plus I don't read instructions well so the things that I have been able to do are big time cool to me.
. . . I want to add to my blog roll too. I did figure out how to do that but need to update it really bad because I have found some really cool blogs that I want to share.
. . . And, I really want to figure out how to link to another blog in my post. You know how you write "so and so did this go here to check it out." I just can't figure that out. So as you see I didn't get the blog all madeover like I wanted. I didn't make it to the sewing room like I wanted. I did almost get the kitchen organized. I actually took one cabinet and just crammed stuff into just to get the boxes out of the middle of the floor. But at least the counter is cleaned off and the sink is clean. I was reading a blog last night and it was talking about this blog that I have heard of that a bunch of people just rave about. I went over to check it out and was disappointed to see that you have to pay for all of her words of wisdom. It frustrated me. And so I have been thinking about that. I know there must be other people out there like me that for whatever reason don't have extra bucks to spend on design and journals and household planners and stuff. So it makes me appreciate all the more blogs like Kelli's and Home Sanctuary. People that share their ideas and that give us wisdom and encouragement and wonderful decorating ideas. So thank you guys for all the encouragement you give. And for all the others I'll be listing you soon because there are people like Amy and Randi that just encourage and inspire me. So once I figure out how to do all that fancy stuff I'll let everyone know how to just pop on over right from the middle of my post. Until then check out my sidebar for the buttons and my short list. Thanks dear friends for all your encouragement. I have too many things on my list but here it is. Sorry no photo's still have that camera problem so please just visualize for me and cheer me on to get it all done. I have a million other things to do but I know it will be a major quest to complete these tasks along with all the other regular daily things to do. But these are the things I have already done this moring. Oh one more thing on my list of things to do today! your faithfulness to the skys. your justicelike the great deep. Oh Lord, you preserve both man and best. Good Monday morning. It is a beautiful day today. I went over to visit Kelli this morning and found she was doing the Simple Woman's Day Book. And, I thought it was so cool I decided to do it too. Outside My Window...the grass is growing and the horses are grazing only a few feet from my window. Yea God! I am thinking... I am enjoying this task and I hope that someone is blessed by my thoughts. I am thankful for... I am so very thankful that the horses are a few feet from me and grazing, for my new house and for my kids and my Cowboy husband. From the kitchen...No cooking today. I am still trying to get it organized so maybe I can take photo's and do Show and Tell Friday. I am wearing...Barn jeans and boots just finished up outside but about to get a dressed up for an outing. I am creating...I will be creating the aprons that I am behind on. I am reading...all I am reading right now is my Bible because I am so behind and I know if I start any books I'll be too absorb. I do read to many blogs everyday. I am hoping...that anyone that reads my blog is Blessed and is drawn near to God our father. I am hearing...my husbands cowboy music in the background. He loves to listen to it each morning. One of my favorite things...s.itting in the cool of the evening and watching the animals. O Lord you preserve man and beast.